faiths and cultures near the end of the year. The U.S. has traditionally been a Protestant Christian nation. However Protestants are believed to have become a minority for the first time during 2006. 4 Meanwhile, according to the national ARIS study, about 75% of American adults currently identify themselves as Christians -- a number that is decreasing by about 0.8 percentage point per year. If this rate continues, Christianity will become a minority religion in the 2030s. Most Americans will then either have no religious affiliation or will identify themselves with a non-Christian faith. The increasing membership in new religions, like New Age, Wicca, etc. A return by many Native Americans to the Aboriginal faiths of their ancestors. America is clearly becoming more religiously diverse. Canada, Europe and some other countries are following the same trend. Reflecting this increase in religious diversity, there are now many religious celebrations widely observed during the month of December in North America. Many are related to the day when the winter solstice occurs. This varies each year between DEC-20 and 22. This date has the shortest daytime and longest nighttime of the day, in the Northern Hemisphere. Some religions, like Islam, use a lunar calendar which is not synchronized with the secular Gregorian calendar. Their celebrations occur about 12 days earlier each year in the Gregorian calendar. Bodhi Day by Buddhists. This recalls the date when Buddha attained enlightenment. (DEC-08). Christmas by Christians. The ancient Christians took over Saturnalia, an ancient Roman Pagan seven day festival of Saturn which started on DEC-17 and used it to commemorate the birth of Yeshua of Nazareth (Jesus Christ). Internal evidence in the Bible indicates that he was born in the Fall between 4 and 7 BCE. Hanukkah (a.k.a. Chanukah, Festival of Lights, & Festival of Rededication) by Jews. It is an eight day holiday that begins on the 25th day of Kislev which can occur in very late November or during December. Rabbi Allen Maller has donated an essay for this web site titled "Why Hanukah is for Muslim Jews." Id al-Fitr by Muslims for a few years before 2006. Between 2006 and 2008, it was Eid al-Adha, the Feast of Sacrifice or Day of Sacrifice. During 2009 and 2010, it was Ashura, the Day of Remembrance. In 2015, Sunni Muslims observe the birthday of the Prophet Muhammad on the 12th day of the Islamic month of Rabi' al-awwal Milad un Nabi in 570 CE. Shi'a Muslims observe it on the 17th of that month. This translates to DEC-24 or JAN-04 according to TimeAndDate.com. Saturnalia by Nova Romans (a.k.a. Romana). 1,2These are Neopagans who worship the ancient Gods of Rome and who celebrate the ancient Roman holy days. Yule by Wiccans and some other Pagans. Festivus, a celebration "for the rest of us". It is as a simple, rather humorous family alternative to Christmas with a minimum of commercialization. Kwanzaa (a.k.a. Kwanzaa, Quansa) is a week-long, inter-faith celebration -- a cultural holiday celebrating African-American heritage. Omisoka is a very popular end-of-year celebration in Japan. Shabe-Yalda, an Iranian inter-faith celebration in honor of the sun's rebirth. 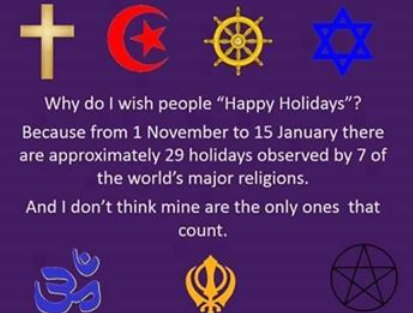 More information on religious and secular celebrations.